One of the world’s largest cruise ships which is currently under construction was evacuated after a fire broke out on deck 15 and causing some injuries. 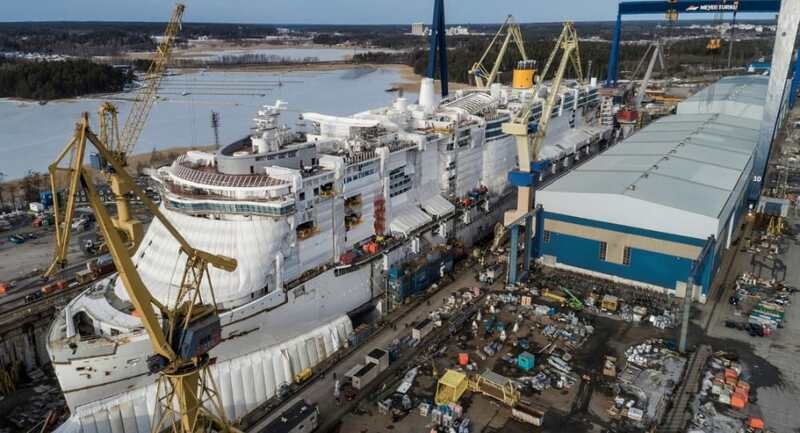 There was an evacuation today at the Meyer Turku shipyard in Finland after a fire broke out on the Costa Smeralda, the largest ever ship under construction for Carnival-owned Costa Cruises. The shipyard released details of a fire on deck 15 of the ship. Some stored equipment was caught on fire after the start of welding inside the ship. The fire first broke out at 4:45 PM local time and all workers were immediately evacuated. Construction of the vessel came to a halt and the shipyard’s own fire crews were the first to respond by activating emergency procedures. Local fire services also attended. The shipyard has stated that ten people slightly inhaled smoke and two of them needed to be checked further. No major damage was done to the ship with only minor material impacted. Construction continued at 6:15 PM and the fire isn’t expected to delay the ship completing in any way. Shipyards are prepared for these emergencies due to the risks from flammable equipment and materials on site. Workers from the shipyard are trained to deal with these incidents. In September 2016 the Norwegian Joy caught fire while also under construction at the sister shipyard of Meyer Werft in Papenburg, Germany. A fire also broke out on the Aidaprima cruise ship while under construction in Japan in 2015. Costa Smeralda is scheduled to be delivered to Costa Cruises in October 2019. The ship will be fully powered by Liquified Natural Gas (LNG) and the largest ever built for the cruise line. The ship just floated out on to the water for the first time days ago and the focus is mainly on outfitting all the onboard spaces. Once completed, the mega-ship will be 193,900 gross tons have a maximum guest capacity of 6,444 along with 1,646 crew members. Carnival Cruise Line’s Mardi Gras ship is also being built at Meyer Turku and is the same class ship. Another Huge Cruise Ship Has Arrived! It feels like all we're posting about these days are new cruise ships and now Costa Cruises has taken delivery of their newest cruise ship named Costa Venezia.